DIE Martis, 30 die Octobris. Message to M. C. for a Conference about French Commodities. Message from H. C. with Votes against the Canary Company Patent ;--and for a Conference about French Commodities. Vote to address the King against the Importation of French Commodities. Lords to attend the King with it. Message to H. C. to appoint a Committee to go with them. Votes to address the King to banish Priests and Jesuits, and to disarm Recusants. To desire a present Conference, in the Painted Chamber, touching the Matter of the late Conference. ORDERED, That the Committee to prepare a Bill to prevent the spreading of the Plague, being now sine Die, shall meet on Friday next in the Afternoon. Hodie 1a vice lecta est Billa, "An Act for confirming of Enclosures made by Decrees in Courts of Equity." That the House of Commons will give a Conference as is desired. The same Lords who managed the Conferences formerly touching this Business, do manage this, and acquaint them with the Addition to the Vote as their Lordships have penned it. "1. That it is the Opinion of this House, that the Patent of the Canary Company is an illegal Patent, a Monopoly, and a Grievance to the Subject. "2. That His Majesty be humbly moved to call in the said Patent." To desire a Conference touching the Matter of the last Conference. That their Lordships will give a present Conference, in the Painted Chamber, as is desired; as concerning the Votes now brought up, their Lordships will send an Answer by Messengers of their own. The former Lords appointed are to manage this Conference. 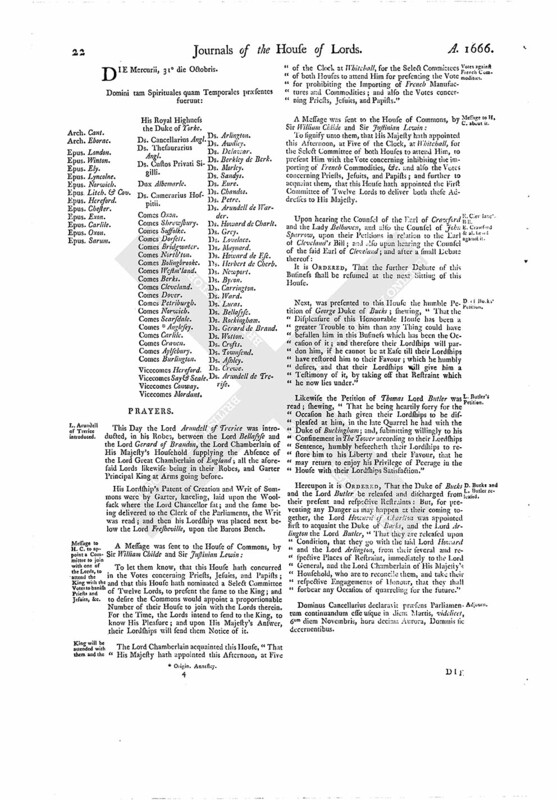 The Earl of Anglesey reported, "That at this Conference the House of Commons did signify, that they have agreed to the Addition to the Vote against the importing of French Manufactures and Commodities, &c."
"That His Majesty be humbly moved, to issue out His Proclamation, prohibiting strictly the Importation of all Sorts of Manufactures and Commodities whatsoever, of the Growth, Production, or Manufacture, of France, and of all other Lands and Places in the Possession of the French King, into any Port or Place of this Kingdom, or Town of Berwicke upon Tweede; and further humbly to acquaint His Majesty, that, unless the like Prohibition be made in all the rest of His Dominions, it is not likely to have that Effect which His Two Houses of Parliament do desire." Epus. Winton. Ds. Berkley de Berk. The Lord Chamberlain is appointed to attend the King, to know His Pleasure, when the Select Committees of both Houses shall wait upon him for that Purpose. 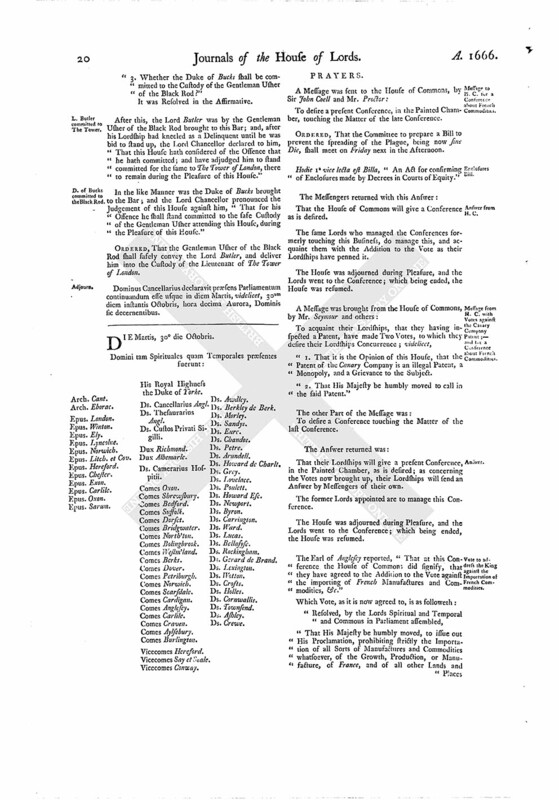 To let them know, that this House hath nominated a Select Committee of Twelve Lords, to wait upon the King, to present the Vote against importing of French Commodites, &c.; and to desire the House of Commons that they would appoint a proportionable Number of their Members to join with the Lords for that Purpose; and further to signify to them, that this House hath sent to the King, to know what Time His Majesty will appoint, of which their Lordships will give them Notice. "That, in order to the suppressing the Insolency of the Papists, His Majesty be humbly desired forthwith to issue out His Royal Proclamation, for the Banishment of all Priests and Jesuits out of this Kingdom within Thirty Days to be therein limited, other than such (not being His Majesty's natural-born Subjects) who are obliged to attend upon the Queen Consort, or the Queen Mother; and that if any Priest or Jesuit shall happen to be taken in England after the said Days, that the Laws be put in due Execution against them." The Question being put, "Whether this House shall concur with the House of Commons in this Vote?" "That, in the said Proclamation, strict Order be given to the Judges and Barons of the Exchequer, and to all His Majesty's Justices of the Peace, and to all other Ministers of Justice, for the putting the Laws in due Execution against all Popish Recusants, and such as are suspected so to be, in order to their speedy Conviction; and that the said Judges, Barons, and Justices, be required, at their respective Assizes and Quarter Sessions, to give the Laws in Charge against Popish Recusants." The Question being put, "Whether to concur with the House of Commons in this Vote?" "That His Majesty be humbly moved, that, considering the present Juncture of Affairs, all Popish Recusants, and such as being suspected so to be, who shall refuse to take the Oaths of Supremacy and Allegiance, being tendered to them, may be forthwith so disarmed, as to remove all Apprehensions from the People, of their Possibility to disturb the Public Peace of the Nation; and that all Officers Military and Civil, and Soldiers, as shall not within Twenty Days take the Oaths of Allegiance and Supremacy, may be disbanded and displaced; and that the Lord Chancellor and Chancellor of the Dutchy respectively do issue out Dedimus Potestatem to such Persons as the Lord General (not being Officers commanding Soldiers) shall appoint, for the Administration of the said Oaths to the Military Officers and Soldiers in His Majesty's Pay and Entertainment, and to the Lord Chamberlain and Vice Chamberlain, Treasurer and Comptroller of His Majesty's Household, and Steward of The Marshalsea, or any Two of them, for the Administration thereof, to the Officers of His Majesty's Household, and to such other Person or Persons as the Lord Chancellor and Chancellor of the Dutchy respectively shall think meet, for doing the like to all other Officers and Persons in all Counties and County Palatine and privileged Places in the Kingdom of England, Dominion of Wales, and Town of Berwick upon Tweed, and also in the Islands of Guarnsey and Jersey, so as an Account be given thereof by the Persons so authorized." 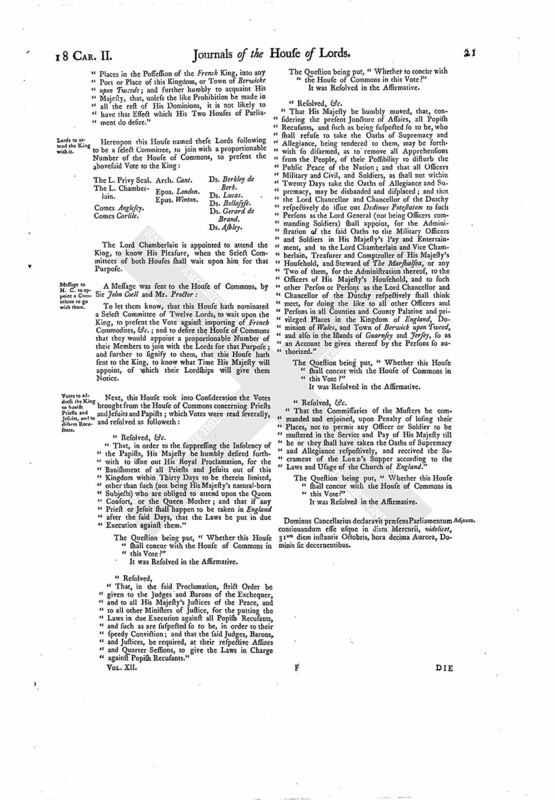 "That the Commissaries of the Musters be commanded and enjoined, upon Penalty of losing their Places, not to permit any Officer or Soldier to be mustered in the Service and Pay of His Majesty till he or they shall have taken the Oaths of Supremacy and Allegiance respectively, and received the Sacrament of the LORD'S Supper according to the Laws and Usage of the Church of England." Dominus Cancellarius declaravit præsens Parliamentum continuandum esse usque in diem Mercurii, videlicet, 31um diem instantis Octobris, hora decima Aurora, Dominis sic decernentibus.